In this file photo, Sen. Cindy Hyde-Smith (R-MS) arrives for a hearing of the Senate Appropriations Committee's Interior, Environment, and Related Agencies Subcommittee with U.S. Interior Secretary Ryan Zinke in the Dirksen Senate Office Building on Capitol Hill May 10, 2018 in Washington, DC. 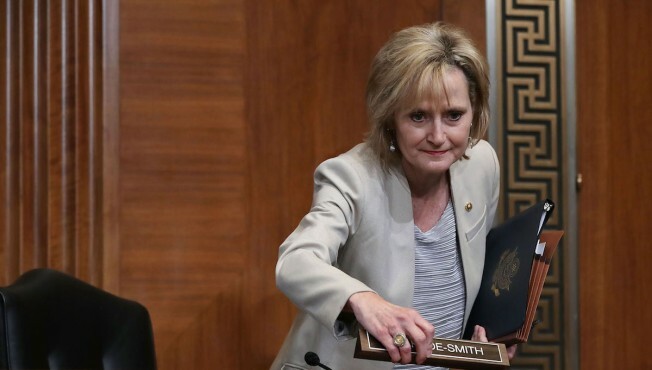 A video surfaced Thursday of Republican Sen. Cindy Hyde-Smith of Mississippi saying it might be a "great idea" to make it harder for some people to vote, and her campaign quickly responded that she was "obviously" joking, NBC News reported. Hyde-Smith, who is in a runoff against Democrat Mike Espy on Nov. 27, made the remark at a campaign stop in Starkville, Mississippi, on Nov. 3. It was posted to Twitter on Thursday by Lamar White Jr., publisher of The Bayou Brief. Smith earlier this week posted video of Hyde-Smith making a comment on Nov. 2 about a "public hanging" that started a controversy. "And then they remind me that there's a lot of liberal folks in those other schools who ... maybe we don't want to vote," Hyde-Smith is heard saying. "Maybe we want to make it just a little more difficult. And I think that's a great idea."